Sat, Apr 20, 2019, 20:52:23 ---- The fact: 42.844.000 visitors done. Thermatool: Successful start-up of an API pipe mill in China Thermatool Corp.
Welding unit which achieves very high quality welds operating at a frequency of 230 kHz. Three Thermatool VIP 500 KW 1 kHz Annealing units are also included in the line. 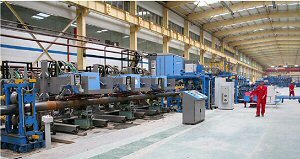 The Annealing units are equipped with Thermatools new Seam Tracking option which automatically follows any wandering of the weld seam to insure that the pipe is always fully annealed. The mill includes an FFX forming section, weld box and cold saw provided by Nakata Mfg. Co. Ltd. of Osaka, Japan. It will produce up to a maximum 13 inch (339.7 mm) diameter by .479 inch (12.19 mm) wall thickness API and structural pipes. units can assist you with your pipe production needs, please contact Thermatool Corp., 31 Commerce Street, East Haven, CT 06512. Tel: (203) 468-4100; Fax: (203) 468-4281; E-mail: info@ttool.com or Thermatool Europe Ltd., Thermatool House, Crockford Lane, Basingstoke, Hants, RG24 8NA, England, (Tel: +44 01256 335 533) or email to: info@ttool.co.uk. Thermatool is a member of the Inductotherm Group of companies.